Happy Monday Everyone! It’s the start of another week (man, how do those weekends fly by so fast?!? ), and I have some really fun projects to reveal to you this week! Before I get to those though, I wanted to show you how my new crafting space is coming along! A few weeks ago, my husband gave you a great tutorial for our new Craft Counter and a sneak peak of how our “Cr-Office” (Craft Room + Office) was taking shape! 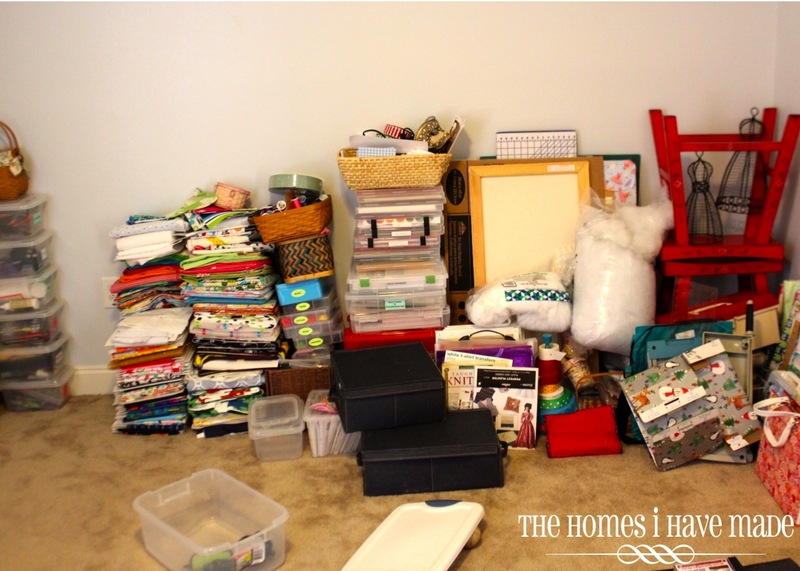 Today, I want to show you how I organized this huge mess! I have lots of fun organizing ideas to show you! The last time you saw the Craft Counter, we had just installed it! I have since filled almost every nook and cranny with storage. 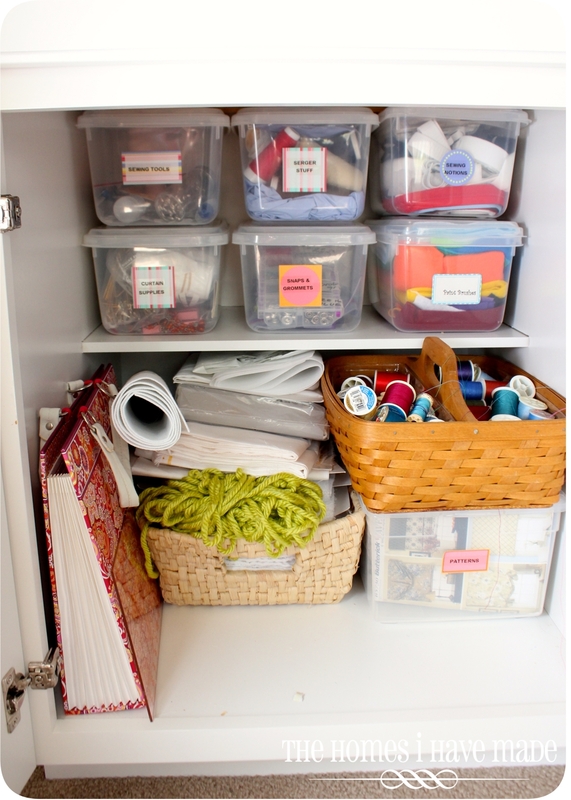 In our past three homes, I have only had shelves to store my craft supplies (consequently, I’ve put almost everything into plastic bins!). At first, I was a little lost on what to store in the drawers! While I was brainstorming ways to use them effectively, I went ahead and made them pretty to look at! Remember when I bought all that fun patterned contact paper? Even though I primarily bought it for some other craft projects, I couldn’t resist the way this paper matched my theme fabric for the room. This stuff goes on SOO nicely, and I absolutely LOVE the vibrant pop every time I open the drawers! In drawer number one, I made a one stop shop for all my cricut cartridges and tools. I simply took the trays out of these storage boxes and laid them right in my drawers. By eliminating the plastic box, I was able to create more space AND now I can access all my cartridges a lot easier and quicker! In the back, I have all my extra supplies to make more ribbon rings as necessary! 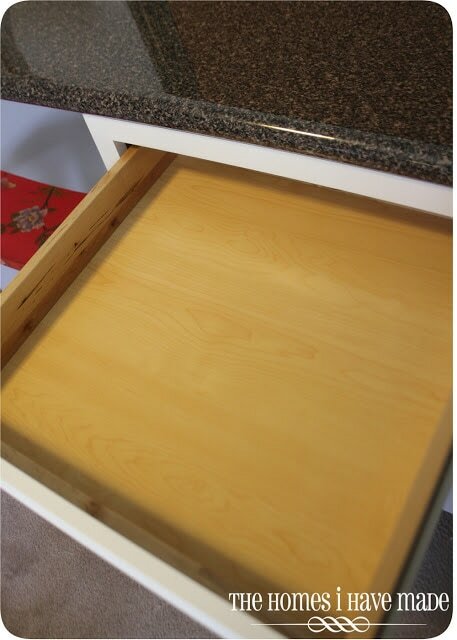 The two middle drawers are much skinnier. The left one holds some of my 12×12 scrapbook paper. It’s hard to tell in the photo (left), but I have clear plastic dividers to separate out each color and collection. (These will get labeled at some point!). 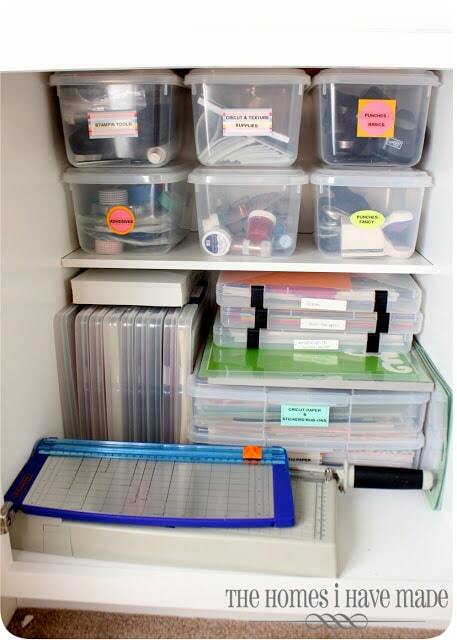 In the right-side drawer, are all my go-to sewing supplies (my sewing machine sits just to the right of this drawer!). I searched and searched and searched for clear, affordable drawer organizers that would help me make the most of this space. I found these here…while not the most affordable, I can’t say enough about these! They are sturdy and have lots of great compartments. I love the two-tier slide-able trays so I can easily access things underneath. 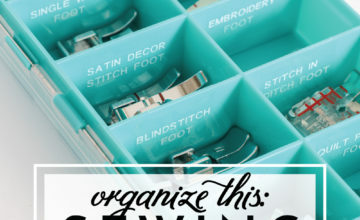 I’ve done a few sewing projects since getting this space organized, and I must say I LOVE having all these tools right at my fingertips instead of tucked away in a plastic bin! 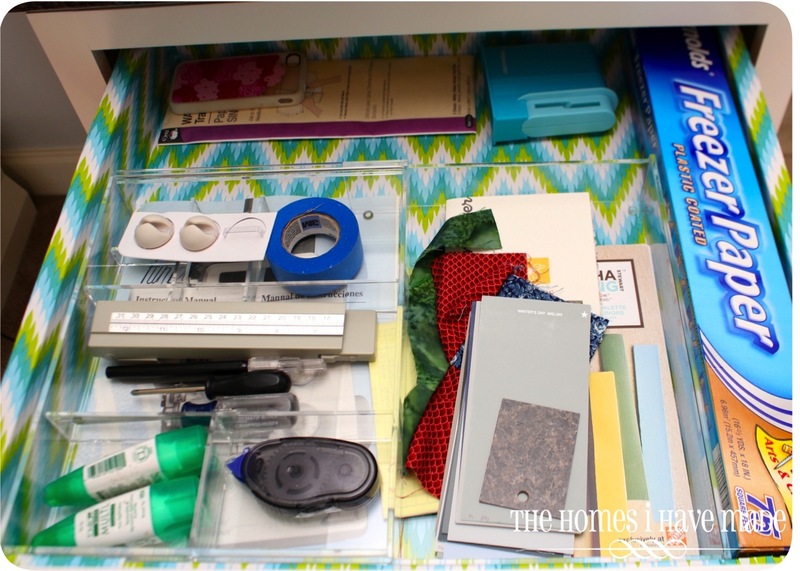 My last drawer is the odds and ends drawer – everyone’s got to have one, right? I put another acrylic organizing tray in here to hold things like my adhesives, screw drivers and other small things. 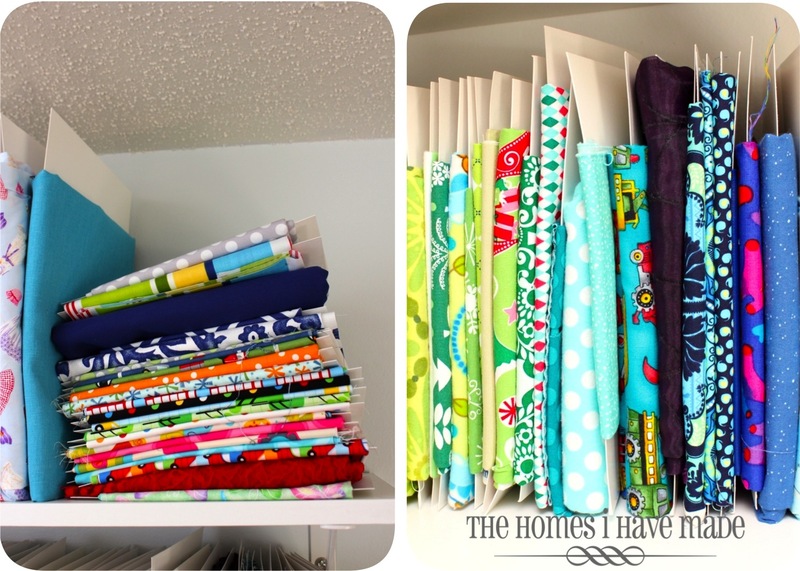 I also keep my sewing machine manuals handy (tucked under the tray) as well as all my paint swatches and fabric choices for our current home! Let’s take a peak in all those cabinets! Even though it’s nice to have some things out of plastic bins and into drawers, I was really excited to see that my plastic bins fit perfectly along the top shelves of all my cabinets. 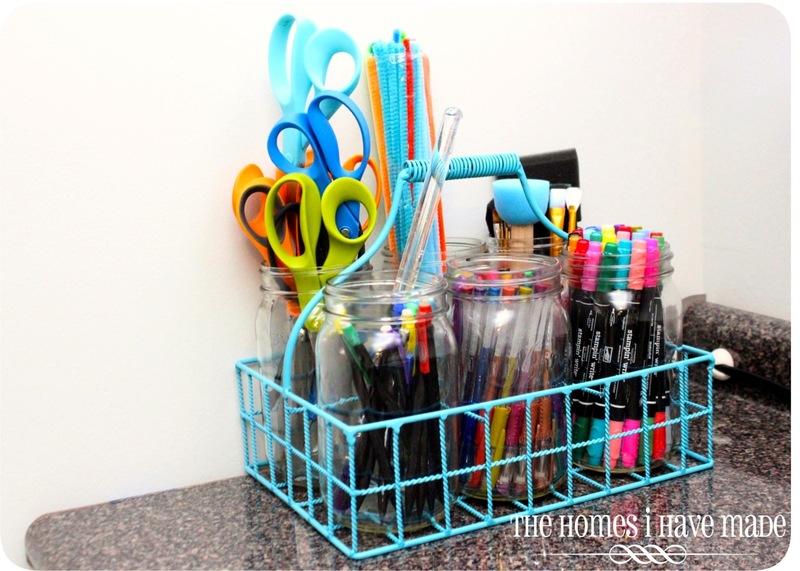 I have found these bins to be invaluable for storing oddly shaped things…you can see more about these bins here! 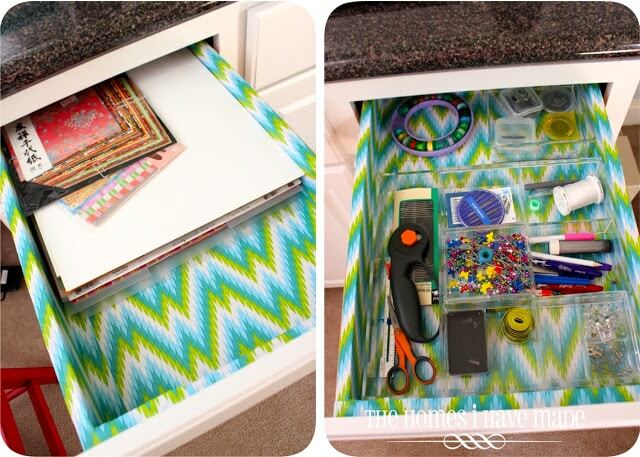 This is the cabinet below the drawer with all the circuit cartridges, so I thought it best to put all my paper and paper-punching/cutting supplies here! 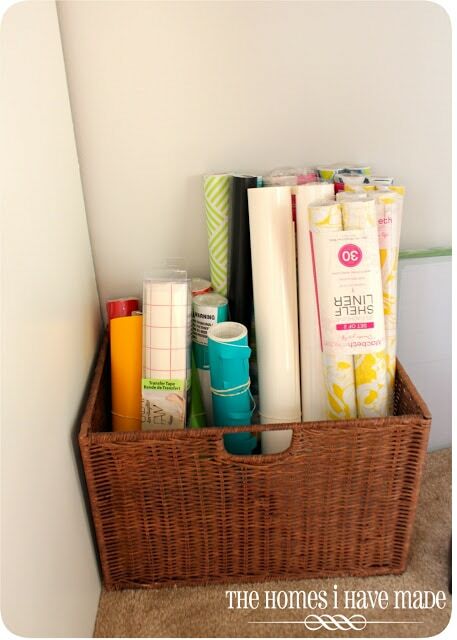 The bins on top contain things like punches, adhesives, and extra cricut tools, while underneath are all my papers and vinyl arranged by color! 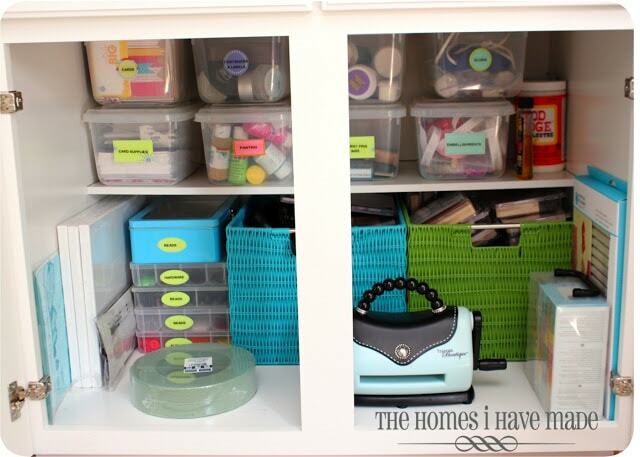 The next cabinet over is the double cabinet and the hub for all my odds and ends craft supplies! In the baskets are all my stamps and stamp supplies. I don’t use them much these days, but wanted to keep them accessible in case the stamping urge hits! Paint, glues, cards, beads, plain canvases and much more all find their home here! When I am organizing a space, I try very, very hard not to pack things in because I want to be able to get things out without much effort. It took some time to get this cabinet just right, but I think I accomplished it! 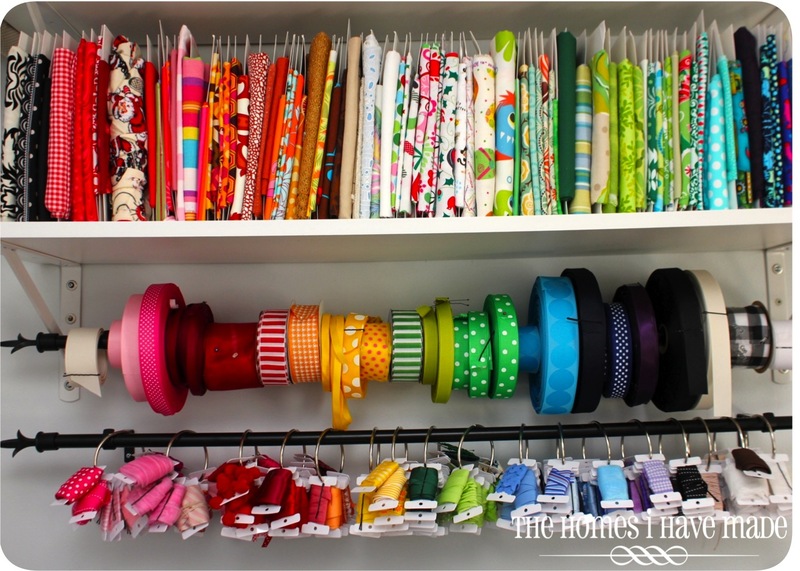 The final cabinet is for all my sewing notions. 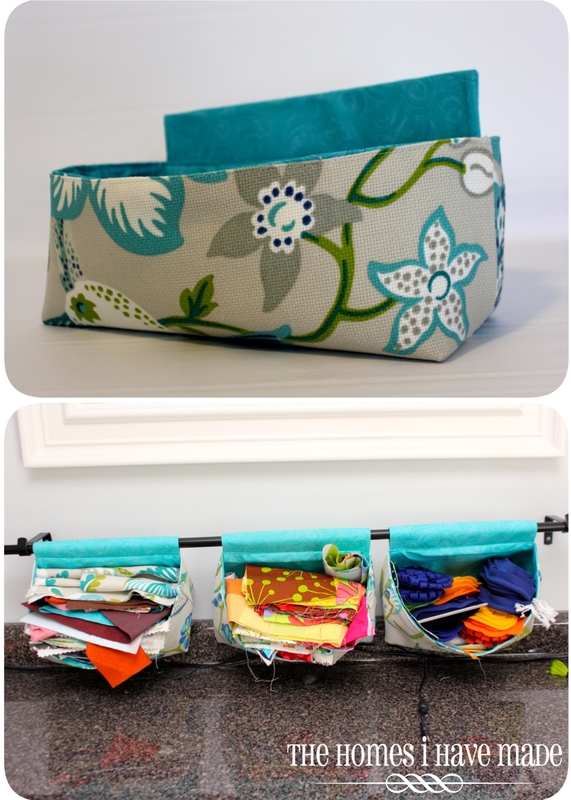 The bins hold elastics, Velcros, snaps, felt, surger thread and more! The plastic box and portable file organizer hold patterns (store bought patterns in the plastic bin, patterns I print out from online are in the file organizer). The center basket holds other odd items, namely yarn and a bunch of “notion”-type fabrics: stabilizer, interfacing, etc! On the floor in the nook between two of the cabinets, I have a sturdy basket tucked away to hold all of my vinyl and patterned contact paper! Let’s take a look at that counter, shall we?!? The WHOLE point of the 2-station craft counter was so I had space not only to stash my supplies, but also have permanent homes from my sewing machine, my cricut and my serger. 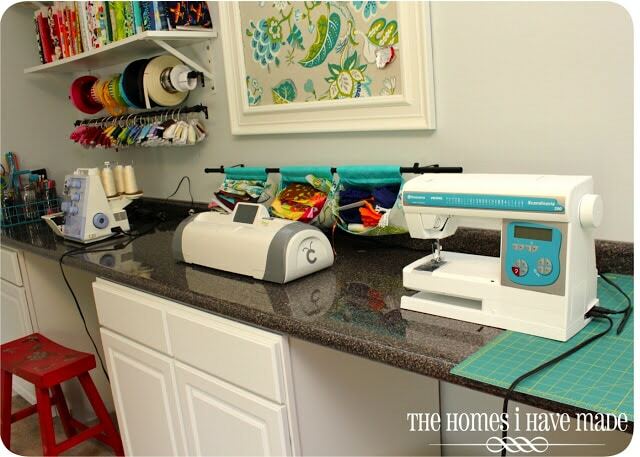 Since sewing (typically) requires sitting, the two sewing machines are positioned at each “station.” The cricut sits in the middle, where I can stand at it no problem! A cutting mat takes up the far right-hand-side of my counter and is where I cut and assemble all my projects! Because we bought this countertop from a warehouse store, we were not able to customize it in anyway (like add a hole for cords to go through), and we were too scared to drill through it ourselves. Ultimately, I have one powerstrip plugged in at the far end of the counter. To keep all my machines plugged in yet the cords tidy and out of the way, I found these great little clips! They stick right on, and several cords can fit in them at one. LOVE them! 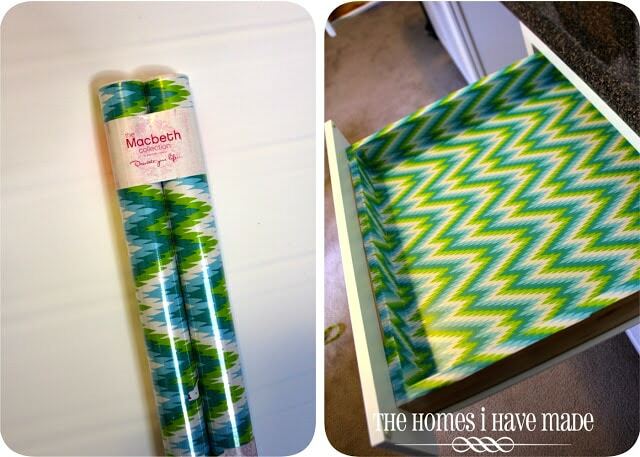 Last thing on the counter is my new craft caddy! This was an old iron silverware caddy that never really got put to good use. 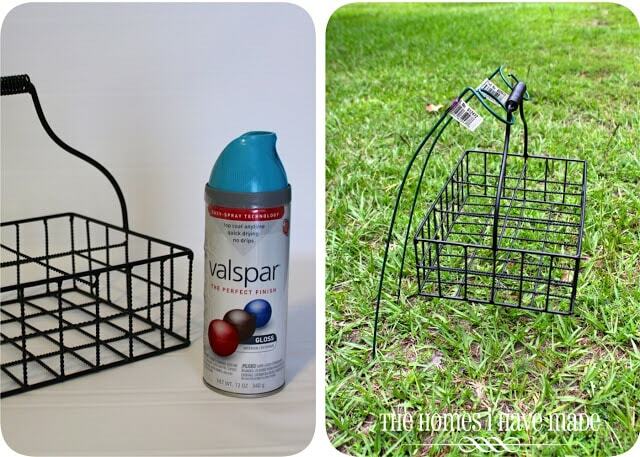 Because of the “basket”-ness of it, I was never able to store things in in effectively. But while walking through Michael’s, I found some huge mason jars, and I knew they were just the thing to make this caddy useful! In went the mason jars and all my “vertical” craft supplies: pencils, glitter pens, markers, scissors, paint brushes, pipe cleaners and popsicle sticks! Just love the order and transportability of this new caddy! Last but not least, let’s look up on the wall! We put up two plain white shelves from the hardware store to hold all my fabric. Home decor fabric is on top and my cottons and prints are down below (and to the right on top) organized by color! 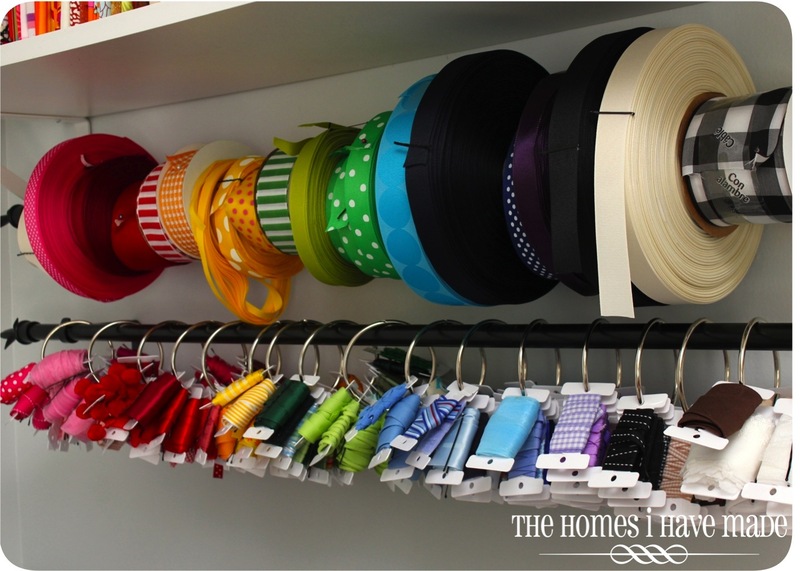 All my ribbon is stored on two curtain rods from IKEA that we already had from our last house! Big spools are all on top and my rings of ribbon are all on the bottom! 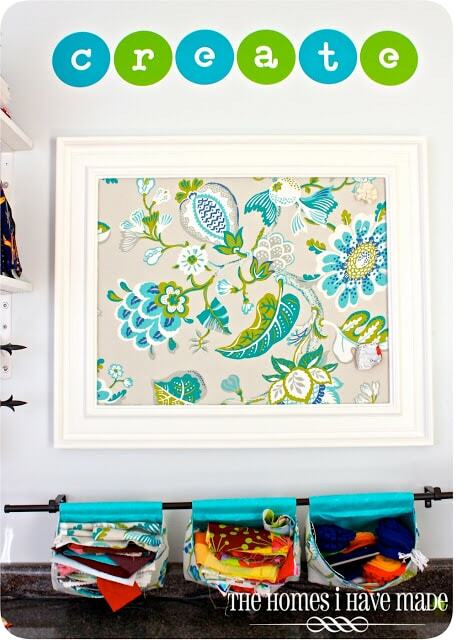 Fabric is wound on “bolts” made of comic book storage boards. I made a deal with my husband that all my fabric HAD to always fit on this shelf. I better get sewing if I want to buy more fabric…I don’t have much room left!! I love how all my ribbon is in one place and so easily accessible. Whether for a project or to wrap a present, I can just pull the ribbon right down! My last storage solution was to make some hanging fabric baskets to store scraps and other things that tend to collect in a craft space! Since I found this idea on etsy, I’ve actually seen others do really great tutorials on how to make your own (although I just made mine up as I went!)! 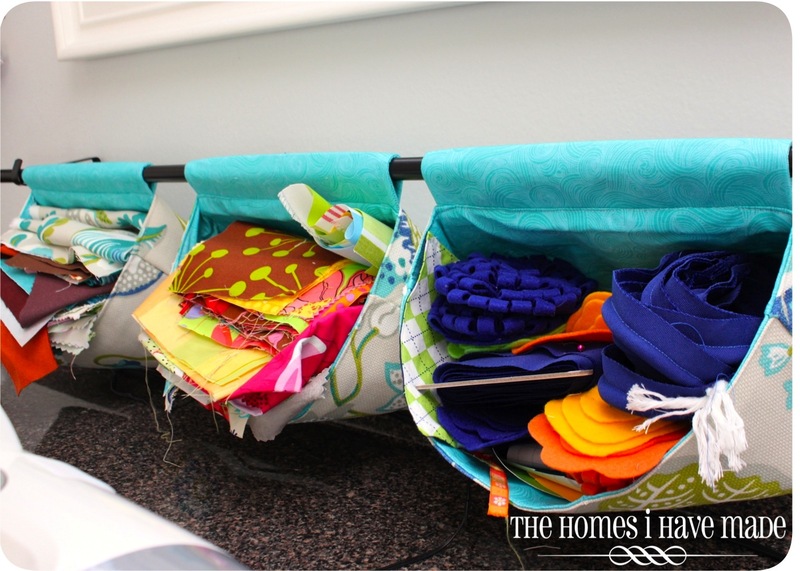 I made three of these cute little baskets…the outside is my main fabric for the space, and they are lined with a coordinating cotton. I lined both the baskets and the rod pocket with heavy interfacing…in hindsight, I wouldn’t have lined the rod pocket because it gets bunchy! Otherwise though…they turned out great and do exactly what I need them to do! This room isn’t quite finished, but I have done a few other projects in here. Here’s a quick peak of the center of my wall, just above those hanging baskets! Once the rest of the wall is done, I’ll have it up for you! Alright! That’s it for today! I hope you enjoyed seeing how I put those cabinets to good use and maybe gave you a few good ideas that you can use in your own space! Have a great start to your week!! 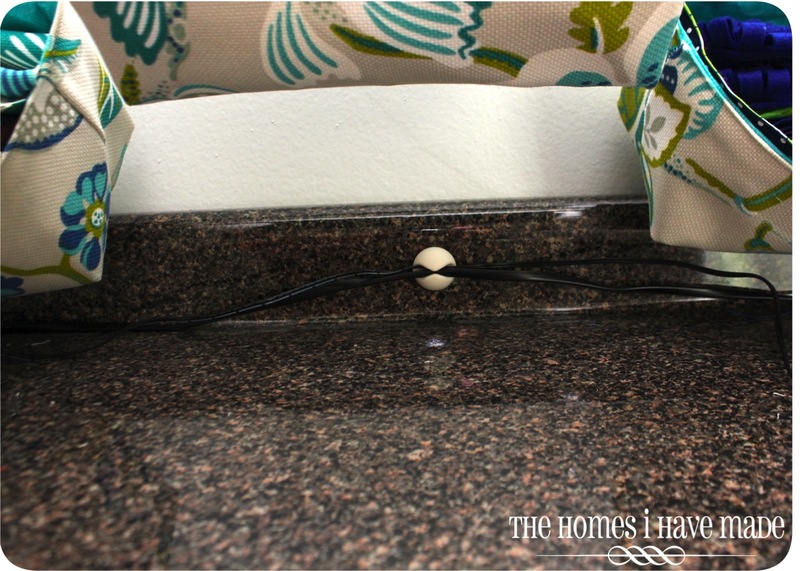 Cloth Napkins from a Shower Curtain! The space looks great…such wonderful ideas. 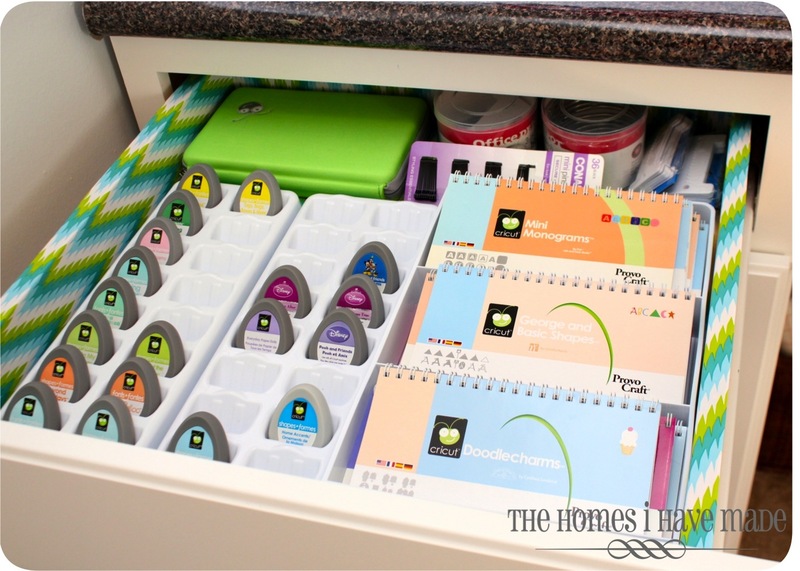 I noticed that you were storing your stampin write markers in a vertical position. 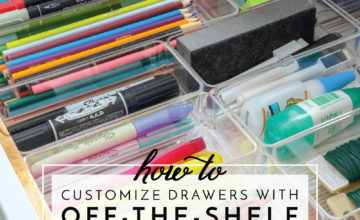 I used to be a demonstrator and we were encouraged to store these markers flat in order to get the most life out of them…just wanted to pass that along! That makes sense. Now I'm going to store mine in an organizer drawer thing I have from IKEA. 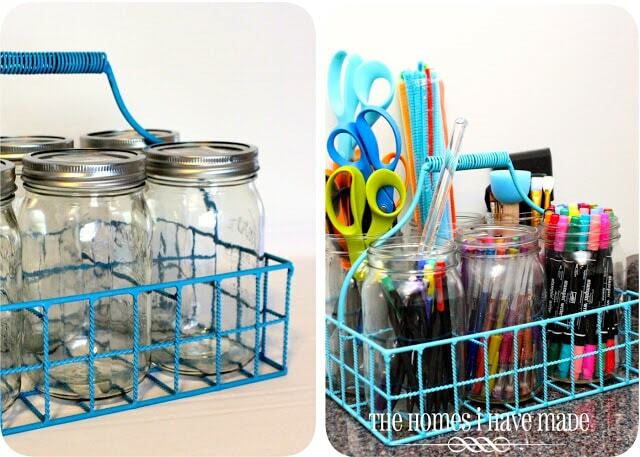 I so wish I had a room just for crafting! 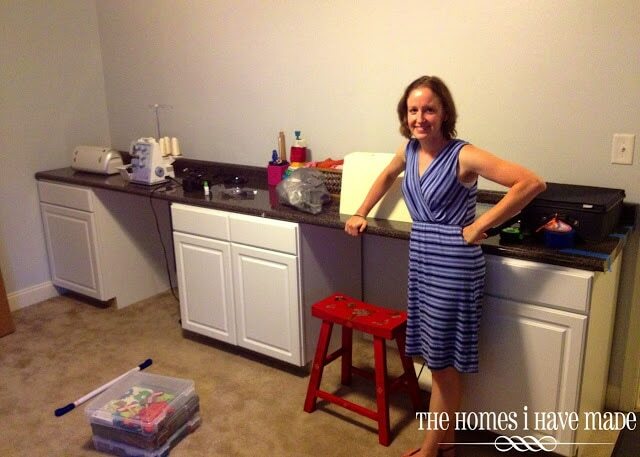 You are one lucky lady (: I love all of your ideas and your space looks awesome! Wow! 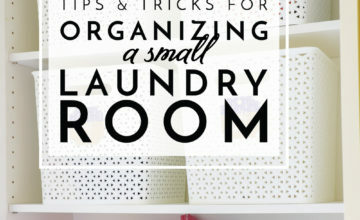 You have done a great job organizing! I love the way the fabric looks! I am stopping by from Tatertots and Jello. WOW! 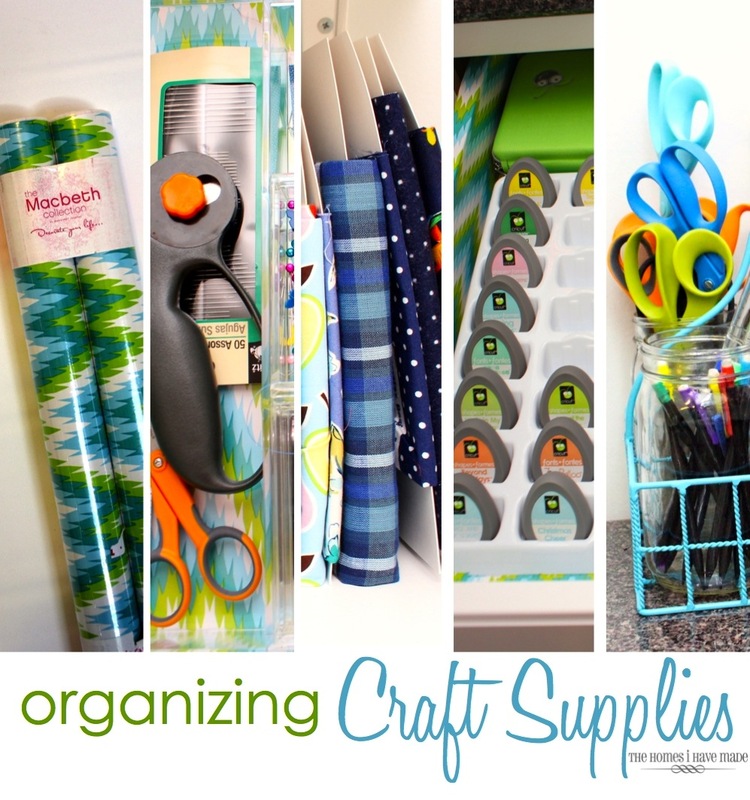 this is a perfect craft space! Love the colors, and I especially love the ribbon organization. 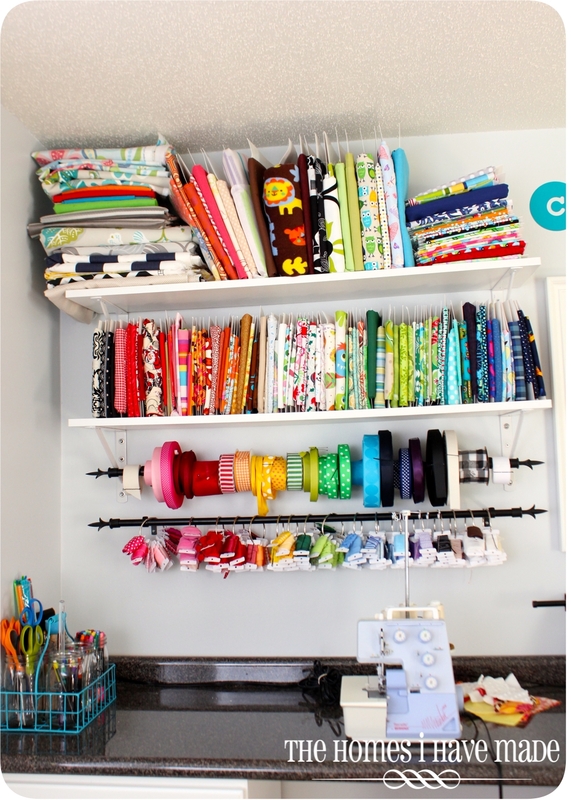 This is exactly what my craft room needs. I love it. I too am a military wife, (Air Force) and love making military friends! Just became a new follower, and I would love it if you stopped by my brand new blog to say hi! And if you feel so inclined, follow me too! Hope you're having a good weekend, can't wait to look around your blog more and find more tips and inspiration. Where did you find the 12 x 12 boxes for paper that are skinny? The big ones look like IRIS cases, but I've never seen the little ones, and would love to have some!